Are You Managed or Led? Leaders are from Venus, Managers from Mars. One of the most important business issues in these times of change is the quest for leadership. How do managers become leaders and how can we recognize genuine leadership? Since few of us are able to find solutions within ourselves, the result of this quest for answers is in many cases is a search for guidance and for ‘gurus’ to lead the way. My answer? Managers should not try to become leaders. Managers and leaders possess entirely different qualities and are otherwise totally different in character, approach and business contribution. They generally have quite different personal needs as human beings as well. Management solves ‘closed problems’: how do we get from A to B as efficiently as possible? So they are familiar with ‘B’. ‘B’ is predefined, and therefore Management has essentially just one viewpoint. Leaders, on the other hand, first develop and define ‘B’ and then convince others to see ‘B’ the same way as they do. Leaders are the dreamers and the solvers of open problems, looking at the world from multiple viewpoints. “I have a dream!”. That’s an open problem. Managers seek complexity while leaders ultimately value simplicity. I know very few examples of people who are both managers and leaders. Leaders usually do not know that they are leaders. Leadership is not an ego thing. You will not find leaders in ’leadership seminars’: these are very much a management thing, as checklists neither trigger leadership nor encourage the leadership spot in your brain. 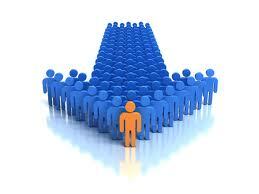 Leaders merely lead; they are seldom interested in personal branding or impression management. Che and Mandela didn’t really know they were “Che” and “Mandela” until it was revealed to them. What do leaders do? They share their vision and act out, based on their belief, their ‘point B’. ‘Chase the vision, not the money’. That’s what drives leaders, not managers, to constantly create value cases rather than cash-based business cases. They just adapt the (eco)system in order to achieve their vision. How does it feel to be managed? How does it feel to be led? Manage companies, lead people. Don’t manage people! Management creates followers. Leaders create leaders. Quite a different attitude. I would like to share one more thing. A lot has been said and written about leadership and management, I’m well aware. One point I would like to make however is that genuine leaders usually are not aware of their leadership and that leadership requires a very different state of mind to management. The issue is not that there is no leadership in (Western) business communities: it is often quite easy to find a lot of leadership, especially in the lower ranks of a company: employees with a lot of skills and practical wisdom who are well aware of what needs to be done to achieve targets. The decision that needs to be made is whether you are willing to accept their leadership and stop disempowering them. To say “I empower you” implies that I have the power to give you power, which is itself disempowering. It swamps the message. The wise thing to do? Listen, and connect to them! Don’t forget: Leaders are from Venus. Managers from Mars. Both are needed!